We are excited to share the news that this month's winner of the Cortland Voice Teacher of the Month Award is Whitney Funk, a special education instructor at OCM BOCES (McEvoy Campus). For her hard work and dedication, Funk received a complimentary gift basket courtesy of Edible Arrangements of Ithaca. Funk is in her seventh year as an instructor at OCM BOCES. She works with students with a range of disabilities in grades 3-9 as part of the McEvoy campus' Stellata program. I am a teaching assistant in Whitney Funk's classroom. She is an amazing teacher. I've watched Whitney take in challenging students and have seen them have a complete turnaround. She is dedicated to her students far more than any other teacher that I have encountered. If anyone is deserving of this award, it is Whitney Funk. Nominations are now open for January. 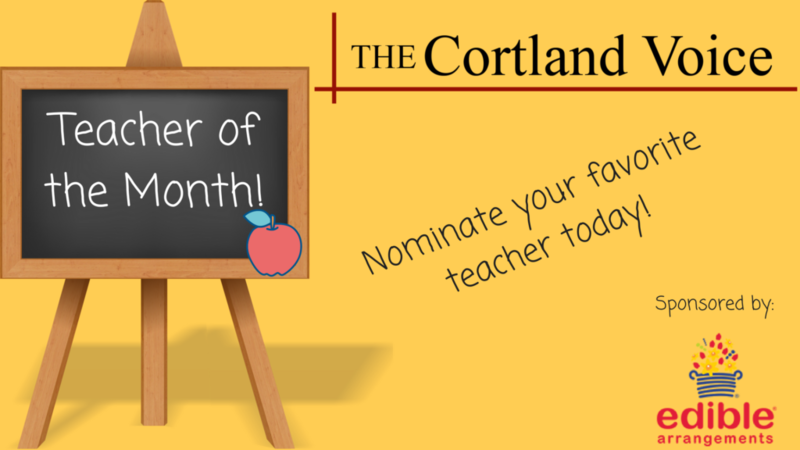 Visit our Teacher of the Month page to fill out a nomination form and vote for your favorite educator!